Chitin is the second biggest available biopolymer on earth, next to Cellulose. It is widely present and spread into Black Soldier Fly. 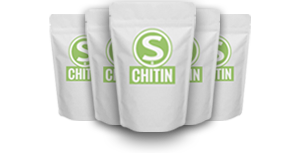 Chitin is used in a great variety of applications, including health and environment. 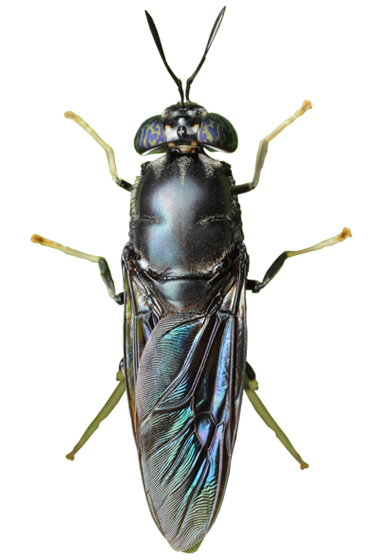 SFly uses a proprietary technology based on bioconversion from Black Soldier Fly. From growing larvaes after the breeding stage, we extract chitin from the larvae with a proprietary / low impact chemical extraction process, to produce multiple stages of refined chitosan, with adjusted viscosity and molecular weight to better suit all markets addressed. Chitin/Chitosan are a high value final product used in cosmetics, pharmaceutical, environmental and industrial applications. Worldwide demand for this material is rapidly growing as potential new applications are discovered virtually every day. By 2016 its overall demand was close to 3 times worldwide production capacities. Biological cycle for Hermetia Illucens : fly-eggs-larvae-pupae-fly. When arrived to grow maturity, larvaes are collected and transformed into Oil and Chitosan, following the SFly Chitin extraction process. The adult phase of Hermetia Illucens is only used for breeding purposes. Chitin extracted from the larvae is of Alpha type and is a working material for the final product which is chitosan. It has a high purity, and a controlled quality. Chitosan obtained from this chitin can be used raw, refined, or transformed (chitosan derivatives, olygomers, etc…). SFly aim is to produce chitosan from Hermetia Illucens larvae with very high throughput, short manufacturing leadtime, and multiple refining options (dedicated to markets addressed e.g. environment, industry, cosmetics and pharmaceutical). The whole manufacturing process, from feed inlets to chitosan outlets will be ISO13485 certified and fully traceable/auditable. Compliant with all requirements for a 3rd generation biofuel (per EU definition), it also has other potential applications (subject to R&D) like animal feeding. Obtained from cold extraction, this oil is a virgin oil and is not transformed nor treated. It is a byproduct from degradation of the feed diet by insect larvaes. Its nutriments balance is very good (N/P/K ratios) and it has a lot of basic natural trace elements. Our biofertilizer is exempt from any traces of heavy metals, medicine and has a low inert content. Short lifecycle: 30 to 40 days. High breeding rate: 800 eggs per laying. High growth rate : 6000 times the weight in 15 days. Waste based specie with a large nutritional spectrum : can help valorize virtually any byproduct from agroindustry and a lot of organic wastes. Best available nutrional profile so far. Strong resistance to diseases (no specific pathology known so far). Autogenic specie: the adult does not feed itself. Non invasive specie, and non disease carrier (for both human and cattle). Large spatial distribution: present on every continent, it allows deploying SFly technology everywhere without having to introduce non endemic / exotic species. SFly has developed an industrial way of growing HI larvae with a high throughput. This way of rearing, along with our proprietary chitin extraction process, allows us to produce a wide variety of chitosans, biopolymer used for environment to medical purposes worldwide. SFLY manufactures normalized products issued from Hermetia Illucens larvaes, and offers a sustainable and fully traceable alternative to production of chitin / chitosan from shrimp and crab shells. Our high quality / high value products can be used for industrial, environmental, cosmetics and pharmaceutical purposes and markets. Worldwide demand for this material is rapidly growing as potential new applications are discovered virtually every day. By 2016 its overall demand was close to 3 times worldwide production capacities.